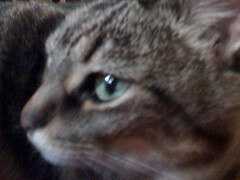 Maggie, my cat, is sitting on my lap, purring loudly. Since I’ve started working from home, she has made it a habit to sit on my lap the entire time I write. Sometimes I feel like she’s glad that I’m home because she gets extra attention, but most times, I just feel like a warm pillow. Sid, the dog, has taken to following me around the house in the hopes that I’ll drop some food. He’s rewarded about fifty percent of the time. It’s not like I’m feeding him treats. I’m just clumsy and sometimes food falls on the floor. Anything down there is fair game to him. He loves carrots. He thinks that grape tomatoes are toys. He’s quick to take anything. He’ll take it to the food dish and start eating it there. If it’s good, it’s gone. If he doesn’t like it, I’ll find it on the floor with a couple of teeth marks in it. No wonder we have mice. Linda, my other cat, and I saw one a couple of weeks ago. It was only an inch long (not including the tail) and it scurried between the floor boards and the wall, just like in the Tom and Jerry cartoons. Linda jumped off the couch and paid vigil at the point where the mouse disappeared for almost an hour. She was very quiet and sat still, just waiting, but the little guy was in the basement and long gone. Maggie found a mouse under my desk. 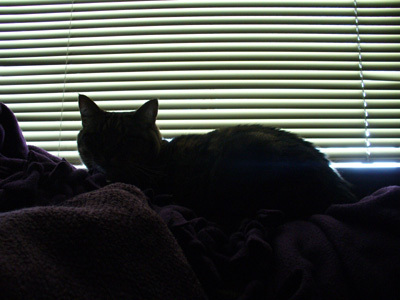 Mike and I were snuggling on the couch with Maggie when she jumped off us quickly scuttling under the desk. We saw her pounce on it and play with it for a bit, but it must have gotten away. This house is over a hundred years old. There are holes and pathways for small animals all over. With the settling on the northeast side of the house, the cracks are getting even larger. I usually clip the cats’ claws, but since I realized that we have a mouse problem, I’ve left their talons unshorn. I don’t want to have to call an exterminator. I don’t want to have to get a live trap or some poison. I don’t even want Maggie or Linda to actually catch a mouse. All I want is for them to scare them away so I don’t have to deal with them. I’m even at peace with cohabitating with the mice. Maybe they’ll eat the grape tomatoes I accidentally drop. Sid sure won’t. Maggie is on my lap. She is purring loudly and my arms are wrapped around her to reach the keyboard. Somehow, this has become a normal routine. She purrs on my lap and I type despite her. It’s symbiotic in a way because her purring calms me down and my lap is a warm pillow. 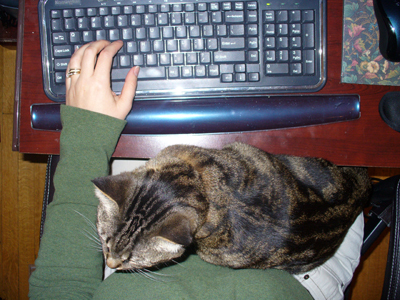 Anyone who could see me here typing would think that it’s an uncomfortable situation, but we both seem to enjoy it. I remember my mom’s cat, Patches, used to sit by her typewriter when my mom was heavy into studying for school. I always thought that Patches was attention-starved, but now, I don’t think that was true. She just wanted to be where my mom was just like Maggie is with me. I’ve never had a cat like this before and it makes me happy to enjoy her company. Photo Note: It took 50 snaps to make this one good picture. I didn’t know how hard it is to take a picture of myself until today. She wants to sit on my lap and be pet. I roll the chair into the sunlight and take her picture instead. It was cold in the house the other night. 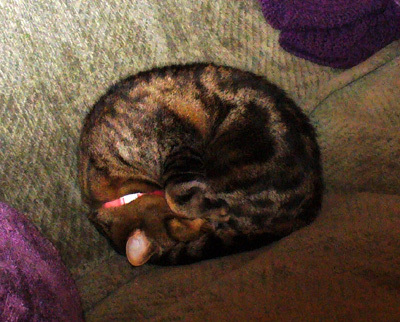 Maggie had rolled herself into a perfectly round ball. I was able to get a quick picture of her. The interesting moments of our lives are so fleeting that it’s difficult to record them with anything but our memories. I’ve finally resigned myself to the fact that I will never be able to get a picture or a video of Maggie sitting on my chest. She comes to me when she wants to, not when I have the camera ready. It’s usually at night when the light is impossibly low. She is so close to my face that I can’t get a good shot. It’s impossible for me to get a good picture or video of her when she is sitting on my chest, purring. I’ll just have to remember it. It’s so rare when I can click a picture of her actually sleeping. She was out for the count, though and I got two photos before she woke up and shook her head. When I took this picture, Maggie kept moving her head away. She refused to look me in the face no matter how much I coaxed her and clicked my tongue. I can’t bribe her with food, she has no weaknesses except for the constant desire to be petted and held. She was on my lap and happy and there was nothing I could bribe her with. Back in September, we adopted Elvis. I find it strange that I haven’t talked about him here yet, but two months of my life kind of flew by while we enjoyed our new kitten. It all started when Stacey and Dan got a puppy. Mini was the tiniest Chihuahua puppy you’ve ever seen and she fit in Mike’s hand. Seeing her made me want a kitten. 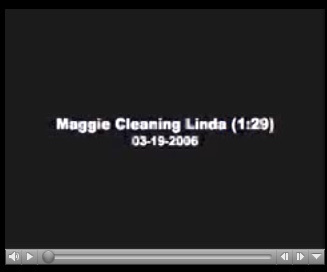 It had been almost a year since Linda had died. Maggie was lonely and clung to me like a needy baby and I thought having a kitten would be nice for her AND us. Within two weeks, I got a phone call from my mom. “There is a 70 year old lady in Reed’s apartment building that is going to abandon a kitten outside. Do you want to adopt him?” Apparently the woman had adopted the kitten, given him ONE day to get used to her current cat and couldn’t stand the fighting anymore. She was just going to let him free outside, near a BUSY road. Within the hour, we had the kitten at our vets office. He was free of parasites and nasty diseases, so we took him home. 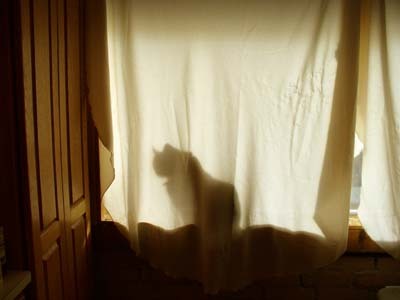 It took Maggie two days to stop hiding under the bed. It took us two weeks to name him. Mike just gave up and let me name him Elvis. The “official” story is that he’s named after Elvis Costello, but really, I named him after Elvis in Animal Crossing. Everybody just thinks we named him after Elvis Presley. After two months, he and Maggie play and fight and I’ve even caught her cleaning his ears like she used to do with Linda before she died. Here’s a video of them playing with their new cat toy. Mike had sprinkled some catnip on it. 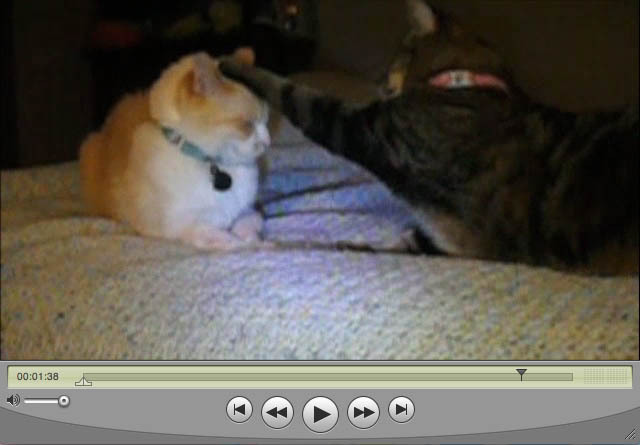 They both wanted it, but Maggie unilaterally informs Elvis that he needs to wait his turn. Adding Elvis to our household has been a joy. I’m so glad he showed up in our lives. I had kicked Maggie off my comfy chair in the bedroom and plopped her onto the bed. When I looked up, she was cleaning Elvis’ ears. She does this several times a week, but usually I can’t get to my camera in time to catch them on film. When Linda died, I thought I would never see anything this cute again, so seeing Elvis and Maggie together like this makes me happier than I can say. I love this photo of Maggie. Sometimes I need to just take a moment and learn how to relax like Maggie does. Lately, it seems that I only relax when I’m so exhausted that I can’t do anything else. Sometimes the camera just can’t capture my most joyful moments. The other day, Maggie was playing with Elvis’ toy mouse. The sunlight was streaming in the faux stained glass window in our living room and bouncing off the carpeted stairs leading up to the bedrooms. 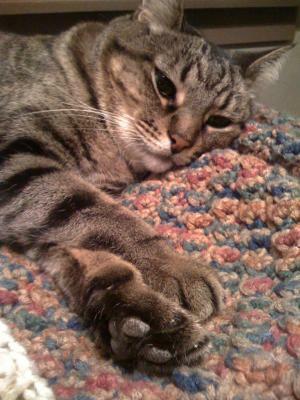 Maggie jumped and rolled and tossed the mouse with glee that is rare considering her shy personality. When I noticed her playing, I pressed pause on the TiVo, which disrupted her play. Just knowing that I was watching her play was enough to stop the festivities. It was as if she was some sort of sub-atomic particle refusing to both play and be observed at the same time. There was no way I would be able to film her. She wouldn’t even let me watch her. Elvis peeked around the furniture trying to catch a glimpse of her playing with his discarded toy, but she noticed him. 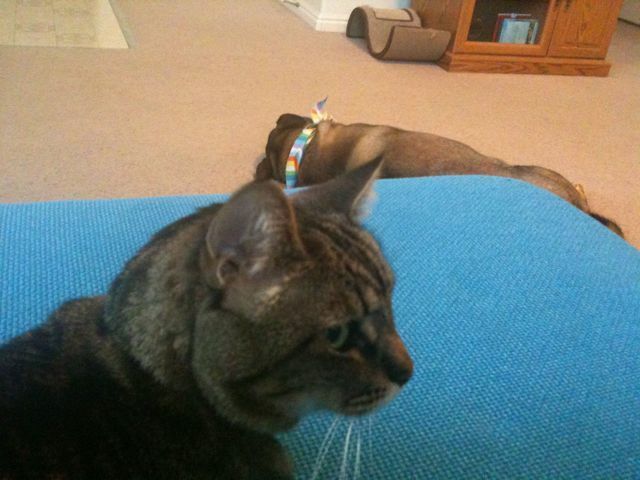 Sid pretended not to watch her play by lying his head down on the carpet, but kept an uneasy eye on her the entire time. With an audience of three, it was too much for her bashful nature and she abandoned the mouse on the third stair next to the scratching post. It happened just a few minutes ago. I heard the sound of a bag rustling upstairs. I had just spent the last half hour chasing Elvis away from every form of plastic in the house, going so far as to actually CLEAN up and remove any bits of plastic bag, plastic bubble wrap or plastic wrapping that was lying around because my stupid cat had decided that it was the day to eat plastic. I rolled my eyes and considered leaving my reading and comfy couch to further stop this obsession. I listened carefully and determined that it didn’t sound like the furtive, chomp, chomp, chomp of Elvis’ plastic eating. It sounded like he was just playing with a plastic bag instead. Laziness overtook me and I went back to my reading, but the noise continued. Then the noise moved. The sound of a plastic bag moved from a distant irritation to an approaching ruckus. I could hear it advancing from the bedroom to the staircase at an increasing speed. I put down my reading and got off the couch to investigate, but before I could get up even one stair, the crinkling was halfway down the stairs. In a streak of white and gray fur, Elvis ran past me toward the kitchen, but the fluffy sound of the plastic bag was still coming at me from the staircase. In a panic, Maggie and the plastic bag rushed past me, following Elvis. She wasn’t chasing him, so much as she was chased by the bag wrapped around her neck. Rather than follow Elvis into the kitchen, she ran like a cheetah away from the noisy monster attached to her body. I laughed at her skittish attempt to escape the crinkle monster that she had unwittingly climbed through. She rushed up the stairs, plastic bag in tow as I tried to grab her. I laughed again and followed to the bedroom level. Mike called from the top of the stairs, “I’m sure that was hilarious, but it just woke me up…” His groggy voice told me that he wasn’t fully awake. 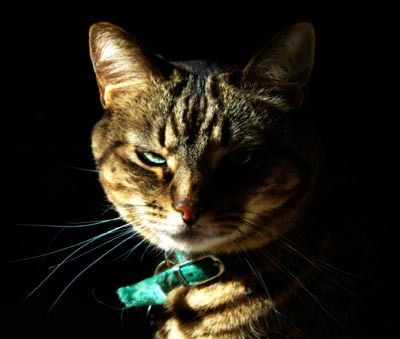 “You tied a bag to the cat? !” I finished climbing and rushed to defend myself, “I didn’t do it.” I was still laughing, trying to find where Maggie had hidden. I followed Mike’s dazed gaze to my comfy chair in my office. I looked under the chair and there was a shell-shocked Maggie with the bag still around her neck. Her excited run had torn it to shreds, but it still hung strong around her neck. She cowered away from me as I reached under the chair. I grabbed the handle of the bag and removed it from her neck, trying my best to control my laughter. It was the plastic bag that had brought home my boots from the store. I had removed the boots, wore them, deemed them completely unusable for winter snow and abandoned them, all without ever throwing away the bag on my bedroom floor. Maggie must have crawled in it, had a bout of play with Elvis and tried to escape through the handle instead of the proper opening. I could envision the entire event and I laughed. I put my sleep-deprived husband back to bed and sat down at the computer keyboard. “I’ll just have to remember this,” I told myself. I’m sitting in my blue comfy chair. 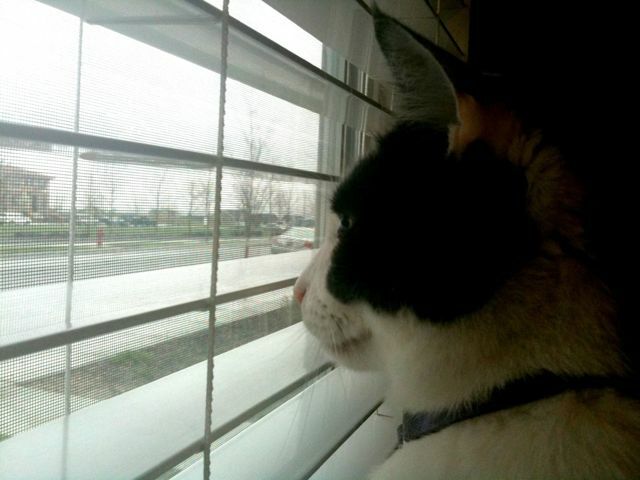 I have Elvis on the left arm, looking out the window, following every movement of birds and debris. I have Maggie to my right, sitting on the footstool and Sid on the floor. I always imagine an alien group observing us. They can tell where all the life forms are in the house and notice that we all congregate in one room, no matter the size of the house. In fact, we are all congregated in one corner of that one room. I imagine that they would find this behavior strange. Why would they all hover in one tiny corner of that large dwelling? Are they scared? They aren’t close enough to be getting any warmth from each other. They each seem to be moving of their own free will. Why do they congregate when they could spread out? They must get some benefit from the close proximity, despite their differences in genetic make up. What is it? 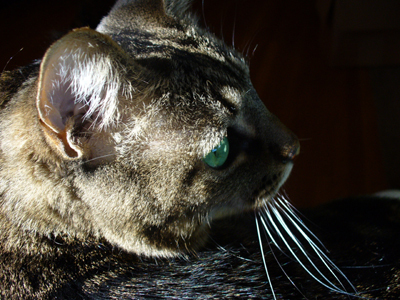 When we adopted her, we had just lost Maggie, my previously adored stripey gray cat. I had no idea how to name her, so I literally let a stranger name her. When we were at the Farmer’s Market, I was holding her while Mike filled out the paperwork for adopting her. An old lady came up to me and fussed over the kitty and we talked. Nice lady: Oh she’s so adorable are you adopting her? 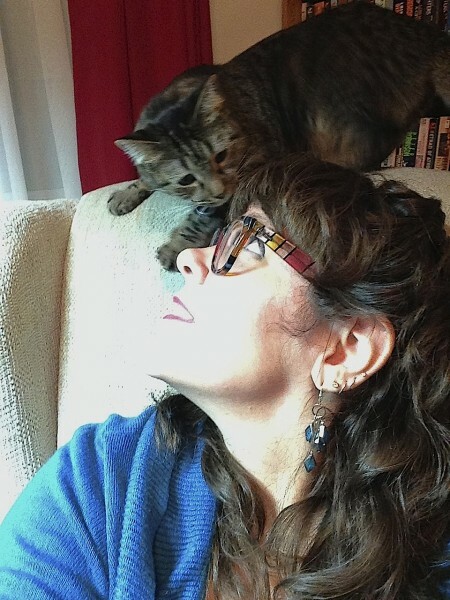 Nice lady: My gray cat just died, too. I’m so sad. 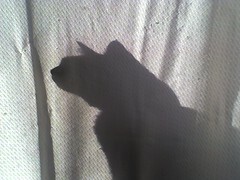 She was such a good cat. Me: Then that’s what we’ll name her. Lucy is a really good name. 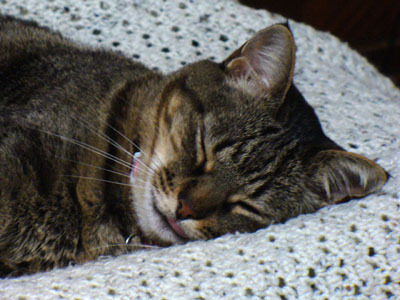 I just realized that I have loved gray stripy cats my ENTIRE life. 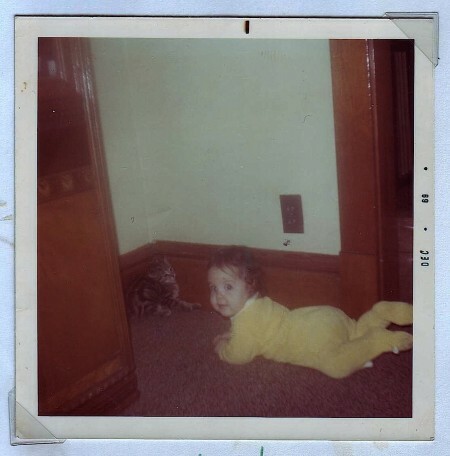 It started when I was just a baby. My mom even provided proof. 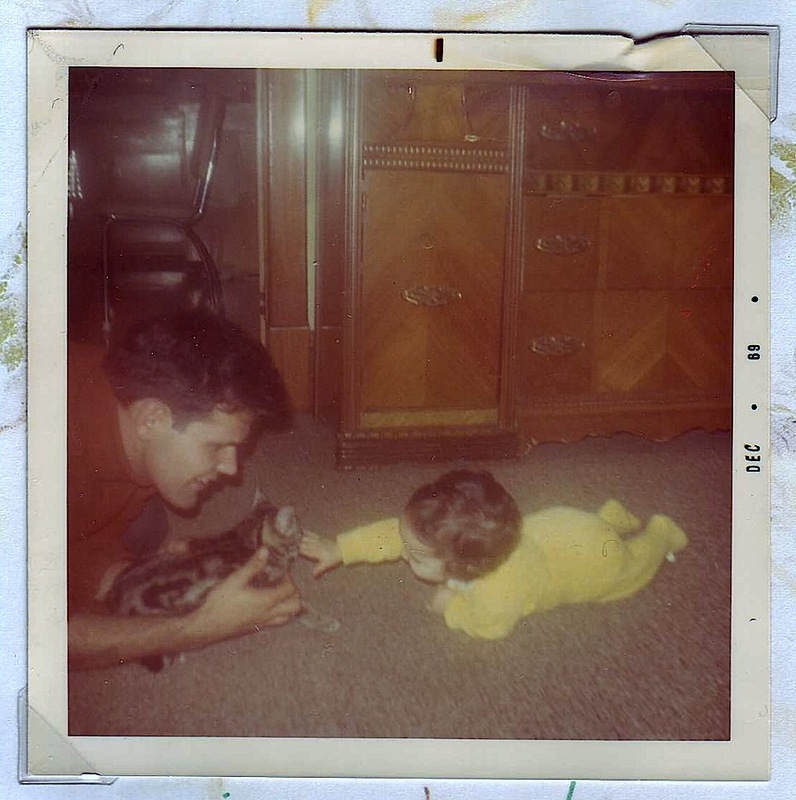 Here is my father introducing me to the kitten. 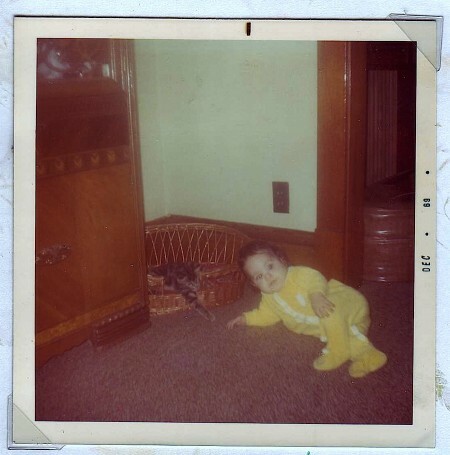 This is 1969 in Norfolk, Virginia at Mrs. Cannon’s House. I have no memory of this event, but it’s obvious I was really interested in this kitty. As a kid, I would look at this picture as proof that the kitty liked me too, because she reached out her paw toward me. I eventually cornered the kitty. I have no idea how this encounter ended, but I like to think that we were both happy. Sometimes, when I’m half asleep and think weird thoughts, I like to tell myself that Maggie was ALWAYS there for me. She just kept coming back to me in the form of a gray stripy cat.